View of Mount Elbert from Twin Lakes, it is the highest summit of the Rocky Mountains and Colorado's highest peak, situated in the Sawatch Range in the center of the state. Where in the United States is Colorado? 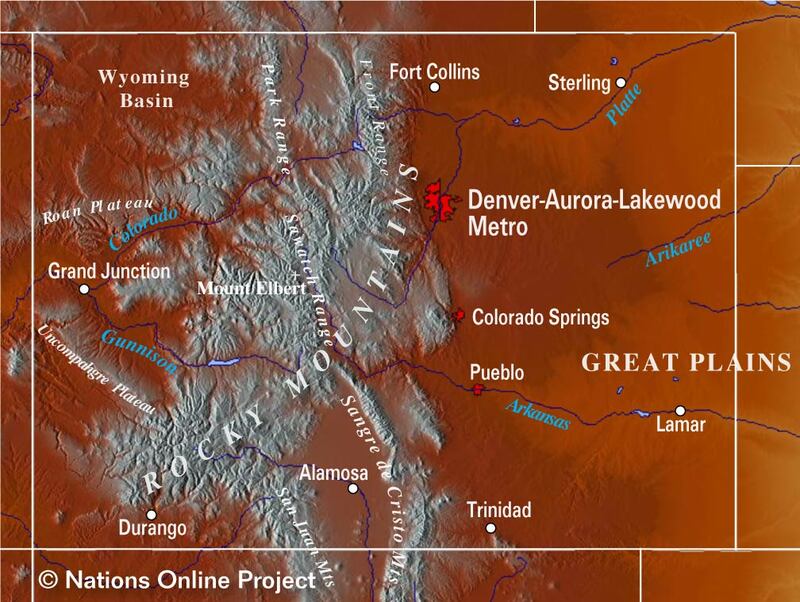 Location map of Colorado in the US. Colorado is one of the 50 US states. The landlocked state, named for the Colorado River, is situated in central United States, it is one of the three states (the others are Wyoming and Utah) that have only lines of latitude and longitude for boundaries. 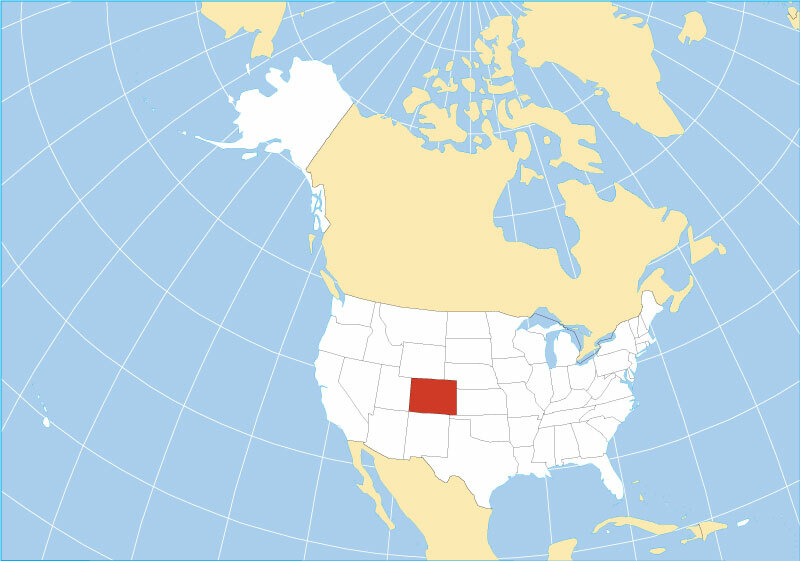 Colorado is bordered to the north by Wyoming and Nebraska, to the east by Kansas, to the south by Oklahoma and New Mexico, and to the west by Utah. A part of Colorado was acquired by the US with the Louisiana Purchase in 1803 and the rest was ceded by Mexico in 1848. 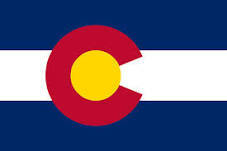 Colorado joined the Union at 1st August 1876 as the 38th state. The Centennial State (its nickname) occupies an area of 269,837 km² (104,094 sq mi) , compared, it is about the size of New Zealand (270,467 km²) or somewhat larger than the United Kingdom (242,900 km²). The state is dominated by the Southern Rocky Mountains in central west, a major subrange of the Rocky Mountains. Highest point in Colorado is Mount Elbert at 4401 m (14,440 ft), it is the second highest peak in the contiguous United States after Mount Whitney in California. The semiarid Great Plains in east are the agricultural heartland of Colorado. Drought-resistant grama and buffalo grasses are the predominant natural vegetation. 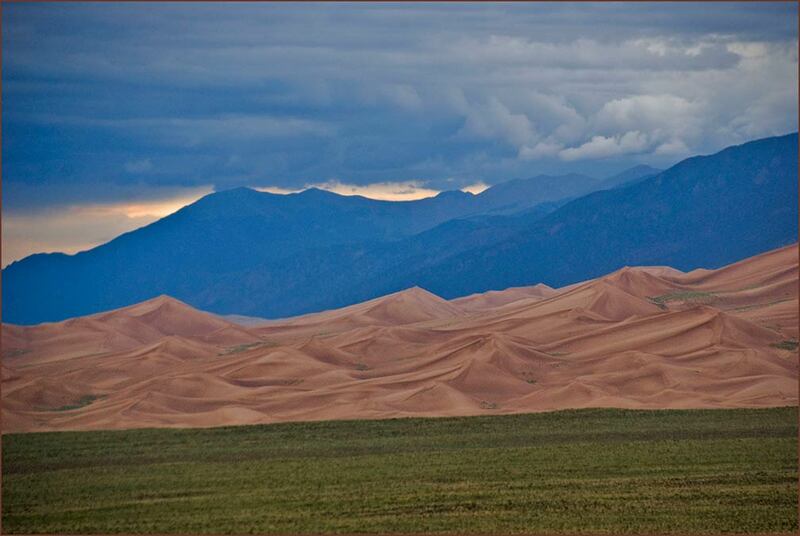 Storm over the Great Sand Dunes National Park in Colorado. I. the Great Plains (High Plains) in east, characterized by flat prairie land with lots of prairie grass and little trees and shrubs. II. the Rocky Mountains in the central west of the state, Colorado's share of the Rockies, the massive mountain range and its subranges dominate the central western third of the state. IV. a small area that lies north west of the Colorado Plateau known as the Intermontane Basin or Wyoming Basin, lying between the Middle Rockies and the Southern Rockies, the Wyoming Basin is an elevated depression. Characteristic features of the Wyoming Basin include hogbacks, cuestas, and numerous basins that are separated by mountains of varying size . The Cliff Palace in Mesa Verde National Park is the largest cliff dwelling in North America built by ancient Pueblo people (Anasazi) on the Mesa Verde plateau between the 6th and 12th centuries. Colorado has one World Heritage Site in Montezuma County in south-west Colorado. A great concentration of ancestral Pueblo Indian dwellings, built from the 6th to the 12th century, can be found on the Mesa Verde plateau at an altitude of more than 2,600 m.
The Mesa Verde landscape contains a great number of Indian habitations built of sandstone and mud mortar, constructed by ancient Pueblo peoples on the Mesa Verde plateau between the 6th and 12th centuries. 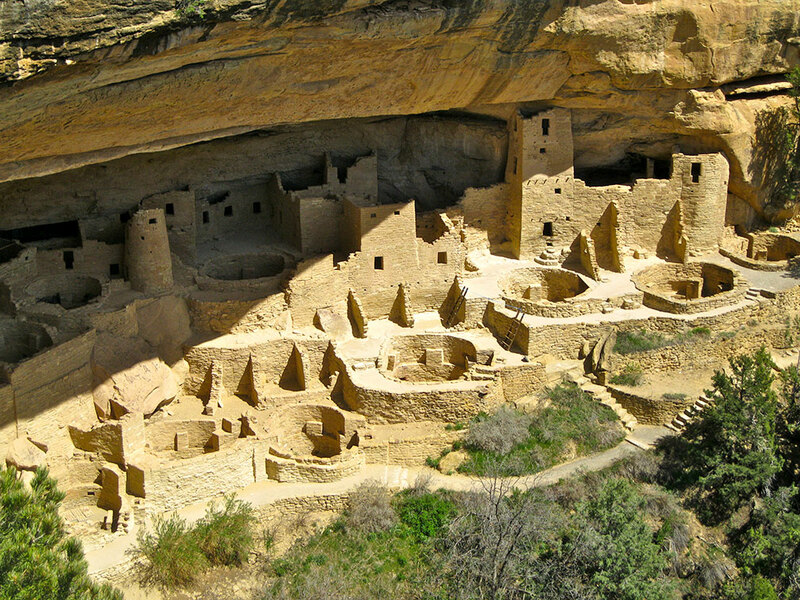 The archaeological site is now known as Mesa Verde National Park . The plateau at an altitude of more than 2,600 m contains also imposing cliff dwellings, built of stone and some comprising more than 100 rooms. See also: Mesa Verde National Park (U.S. National Park Service). 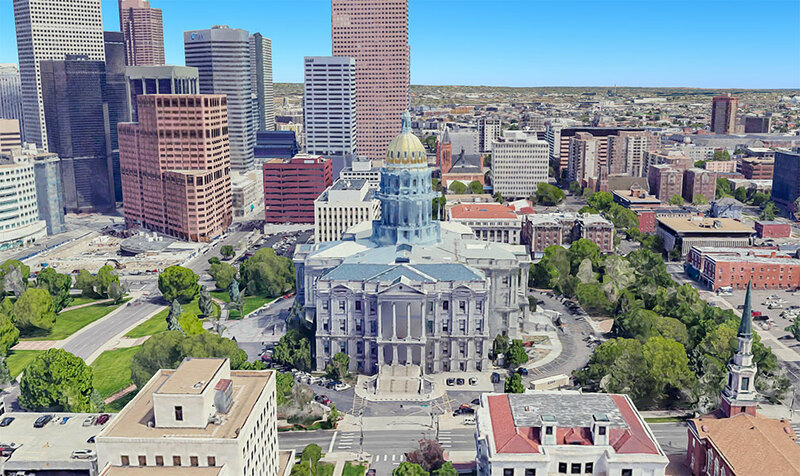 Rendered image of Colorado's State Capitol in Denver. The National Historic Landmark building is home of the Colorado General Assembly. Colorado has a population of 5.65 million people (est. 2018) . Capital and largest city is Denver, largest metro area is Denver-Aurora-Lakewood, CO Metropolitan Statistical Area, where you can find half of the state's population (2.8 million). Spanish is the second-most spoken language in Colorado, after English. Largest airports in the state are Denver International Airport (IATA code: DEN), and City of Colorado Springs Municipal Airport (IATA code: COS). 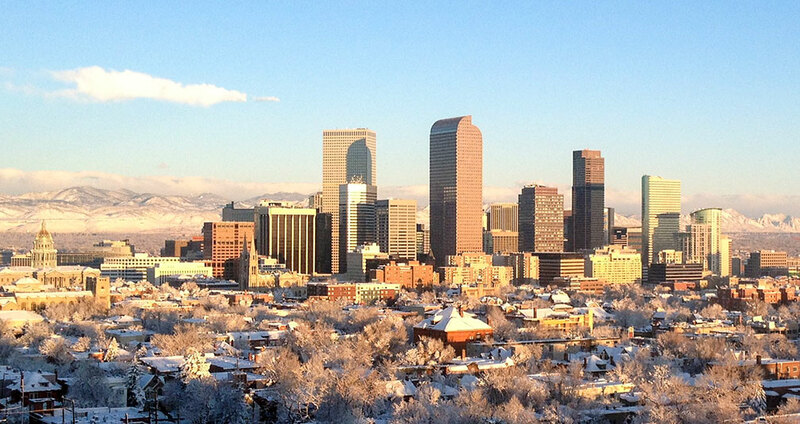 Skyline of Denver Colorado in Winter. Major cities are: Denver, Colorado Springs, Boulder, Fort Collins, and Aurora. 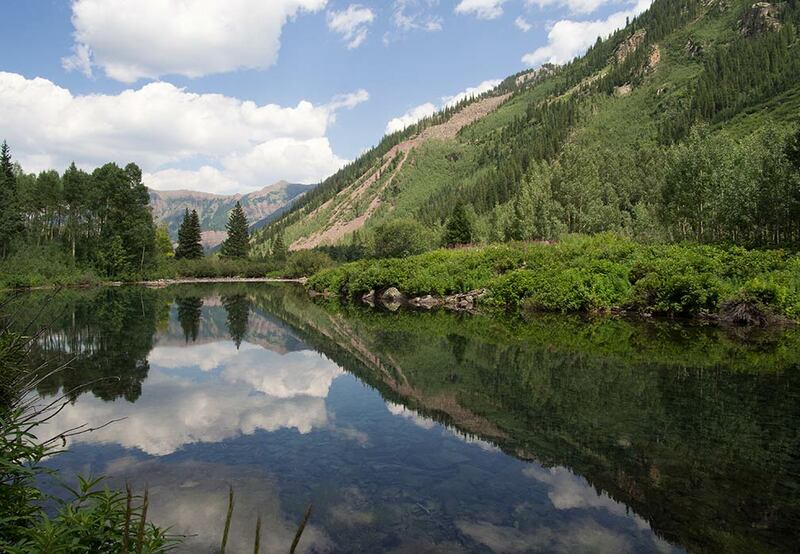 The Maroon Bells area in Aspen, Colorado. Lakewood, Lamar, Las Animas, Last Chance, Leadville, Limon, Littleton, Longmont, Loveland, Meeker, Monte Vista, Montrose, Morgan, Orchard City, Ordway, Ouray, Pagosa Springs, Pueblo, Rangely, Rifle, Rocky Ford, Saguache, Salida, Security, Silverton, Springfield, Springs, Steamboat, Sterling, Telluride, Trinidad, Vail, Walden, Walsenburg, and Wray. 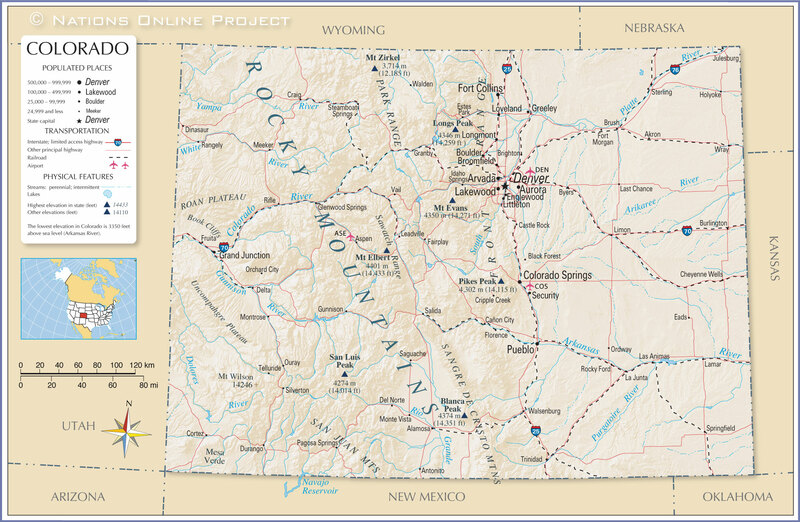 The detailed map below shows the US state of Colorado with boundaries, the location of the state capital Denver, major cities and populated places, streams and lakes, interstate highways, principal highways, and railroads.